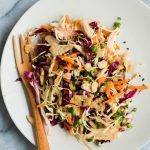 This sesame chicken crunch salad has roasted garlic crackers for crunch, baked chicken for protein, a wonderful mix of vegetables, and a flavorful Asian-inspired sesame dressing. It’s a hit! Preheat the oven to 400F. Lightly salt and pepper the chicken breasts, and place on a lightly oiled (or foil-lined) baking sheet. Bake for 25 minutes, or until no longer pink in the middle, then remove and set aside. While the chicken is baking, combing the sesame oil, garlic, ginger, mirin, and soy sauce. Whisk together, and set aside. Toss together the carrots, green onions, cashews, radicchio, cabbage, sesame seeds, and crushed crackers**. Shred the chicken, and add to the salad along with the dressing. Toss everything to combine, and serve immediately. *I used my mandolin to thinly slice both the radicchio and the cabbage. **The crackers will get soggy if left in the salad for more than a few hours — if not serving immediately, wait to add the crackers before serving.